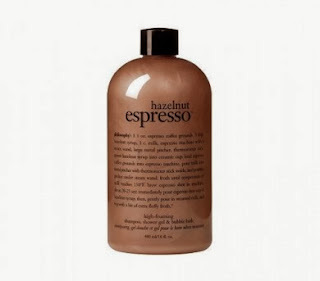 I've always liked Philosophy and remember lusting after their cute and original packaging when the cookbook collections launched all those years ago so I was excited to try the Hazelnut Espresso 3-in-1 Shampoo, Shower Gel and Bubble Bath. As with all of the brand's foodie products, the plastic bottle features a recipe for making Hazelnut Espresso which adds a fun twist. I've never actually tried to recreate one of the recipes so I'm not sure how successful they'd turn out but do feel that the combination of beauty & a recipe makes this the range a good gift idea. The plastic bottle is transparent with a flip top lid making it functional for use. I only used this as a shower gel so I can't comment on how it performs as a shampoo or bubble bath. Thanks to the inclusion of SLS, a generous lather was produced but for me, this would be a downside as I generally find SLS laden products to be drying on my skin. My drink of choice is a hazelnut latte so unsurprisingly, the scent appealed to me. As the name suggests, it has a foodie scent which incorporates a sweet and comforting hint of chocolate. I enjoyed using this but the trouble is that Philosophy's bath and shower products have been much copied. Whilst imitation is the sincerest form of flattery, there's no longer anything sufficiently unique about the products to justify the high price tag. Personally, if I was going to spend so much money on a shower product, it would be something more indulgent & grown up with aromatherapy benefits and without SLS. It's a fun gift but not something I would repurchase with my own money.